In hindsight I may have gone a bit too far, but last year when my better half suggested we could use a few more plants out on the deck I ran with it. She’s not known for her appreciation of things chlorophyll so this was unprecedented, and I’m sure you could understand my enthusiasm for encouraging an interest. For her I thought potted plants were a big no-no, and I’ve found this becomes an even stronger no-no when their planting and repotting takes place on the kitchen table… which is kind of close to the deck table… so perhaps this new interest in the deck plantings was the first step in easing the household ban on pots. Before this garden I used to have quite a pot habit. The small balcony of my apartment was filled and overflowing with any container I could find and any plant which I thought would be interesting to grow out there, and at one point I was a little worried all the extra weight on my second floor balcony might one day come crashing down. But it didn’t, and I kept on happily planting until finally purchasing my first home. 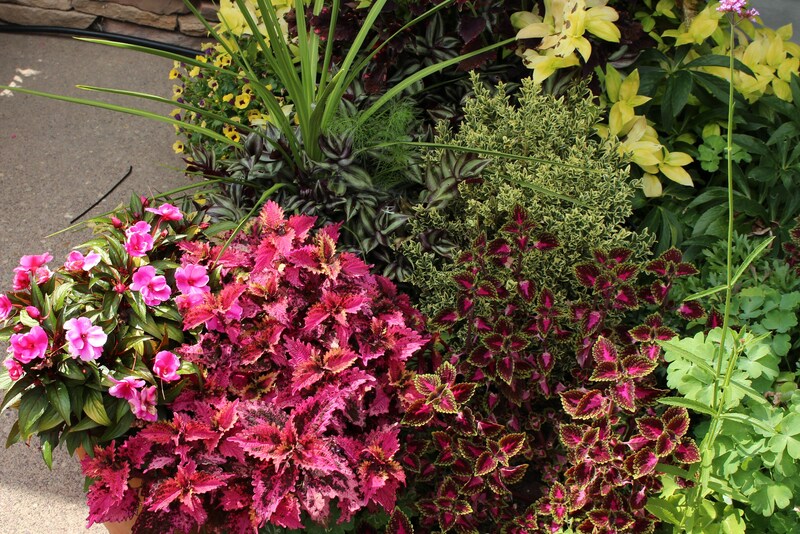 Coleus are perfect for containers, but I far prefer the sun-tolerant, slow to bloom, cutting grown plants rather than any strains from seed. The salvia (Wendy’s Wish) is also doing well enough, but I suspect she would prefer a roomier root-run and not sit in a cramped pot. 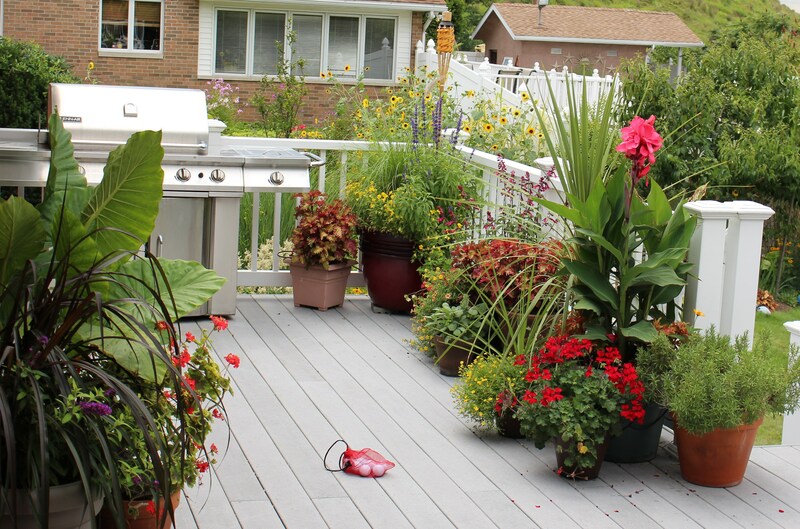 When the deck was opened up to planting I scoured all corners of the yard and garage for any container which might still be able to hold a plant. Many of the old plastic pots from my balcony days came out of retirement and were slid right in next to my pretentious Italian terra cotta and glazed ceramic. I’ll see if I can do something about that next year, but this year most of the budget went to new potting soil. Potting soil has been a sticky subject around here since most of them stink, but I found Jobe’s Organics Potting mix and love its price and quality. It’s made with quality ingredients, it’s airy and loose, and it’s just what I wanted for filling large planters. Slowly but surely the Spanish Flag vine (Ipomoea lobata) is beginning to drape the railing. It had a late start since this was first a spring pansy planter, and they had to bloom out before I was allowed to squeeze in the vine and grass plant. The blue salvia self sowed in from last year… thanks mother nature! I have plenty of favorites which I either overwinter or buy, but this year’s big treat was the Cannova Rose canna which I bought already in bloom and already nearly bursting out of the pot it came in. 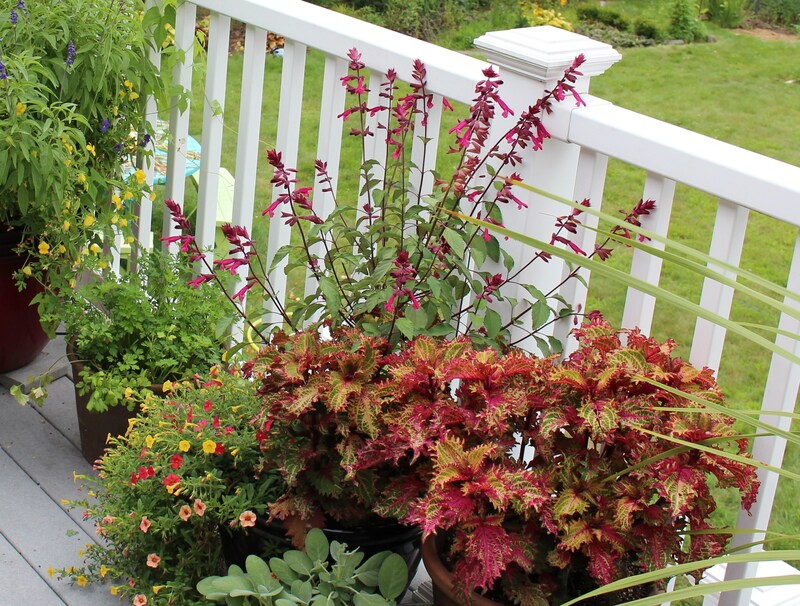 It’s only done better since, and if you ignore some leaf damage from Japanese beetles and a few sloppy spent blooms dropped on the deck, it’s my idea of a perfect summer container plant. This canna is a seed strain and because of that should be virus free, also the breeder claims these plants have been selected to thrive in cooler temperatures, which is another plus for Northerners such as myself. Cannova Rose canna. It keeps sending up new stalks and they keep on blooming. Between it and its overgrown spike neighbor I don’t know which I like more… although I do like the spikes! I need to dig out the label for this lantana. My daughter picked it out and I reluctantly added it to the cart as I thought about lantana failures in my past. This one keeps blooming though and never looks bad. 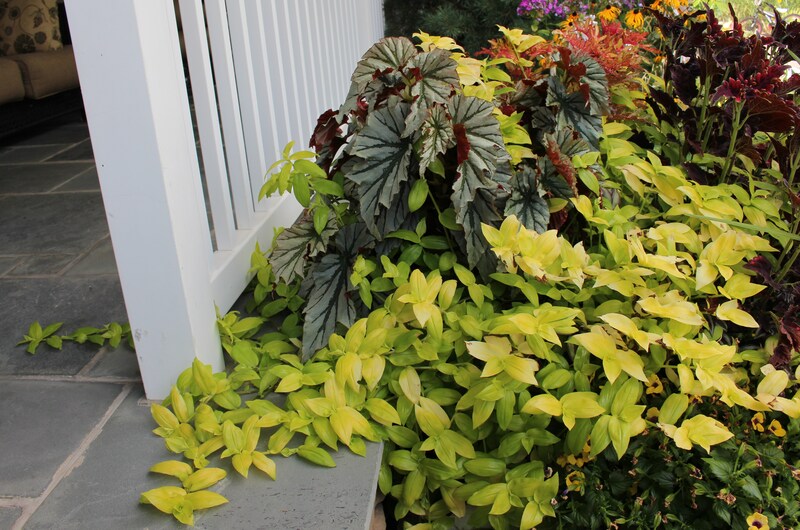 I wish I could say the same for the ‘Troy’s Gold’ plectranthus on the right, it apparently does not like full sun here. The one pink and gold and lavender corner is dominated by another favorite which I nearly left to die last fall. In the late spring last year I picked up a clearance oleander, and this summer it’s really come into its own. Nonstop bloom on the single pink, but there’s a double in there as well, and that one is always a mess with few blooms open and always a few brown soggy spent flowers hanging from the branches. I try to ignore it. 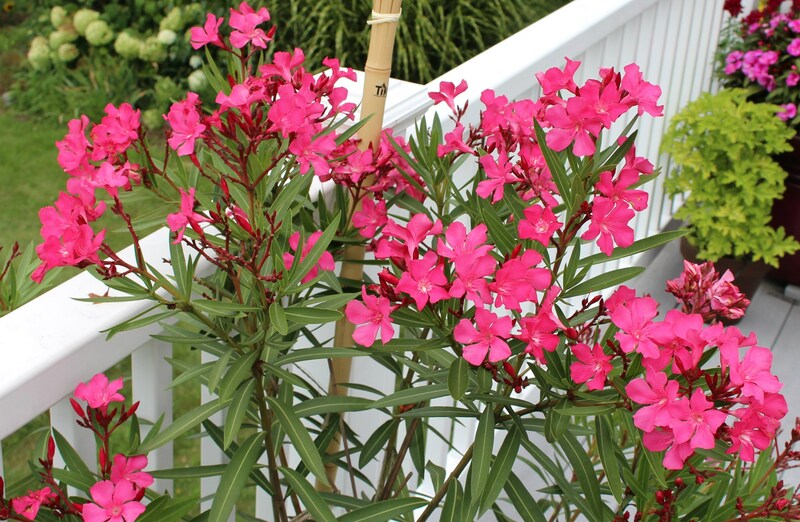 Oleander on the deck. It’s been in bloom since June and I love the bright pink in front of the white railing. As we go around the deck there’s another favorite which I always end up buying new each spring. The purple fountain grass (Pennisetum setaceum ‘Rubrum’) is a pain to overwinter but worth adding new every year for its dark leaves and light airiness of the seedheads. This year I put it with a new rose and although I paid way too much for the rose, and really questioned the decision to plant it on the deck (mostly due to all the blood it drew while planting), I love the effect. Purple fountain grass with rose ‘Black Forest’, ‘zahara sunburst’ zinnias, and ‘double hot cherry’ zinnia. Not to name too many favorites but sweet potato vines always show up in my planters. Some years they cover the deck, some years they hang through the railing, regardless of where they grow I like them and I like them large. There are dwarf types but for me I far prefer the far-ranging ones like chartreuse ‘Margarita’ or the dark purple ‘Blackie’. 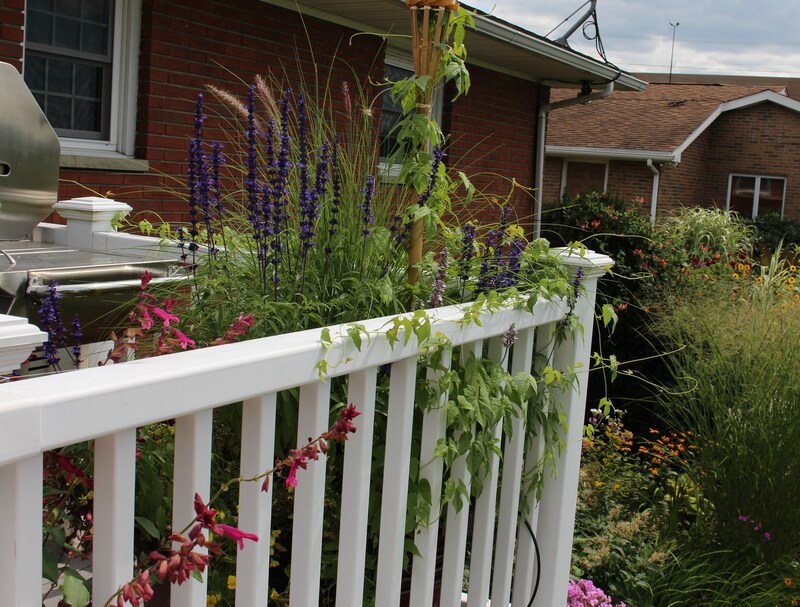 I apologize for going on so long, I’m going to try and be a little less wordy as we go around to the front door plantings. They’re much less floral, but still a mess of color. The hellebore and variegated boxwood are in the ground, but everything else is potted…. not that you would know since the planters disappeared a few weeks ago. 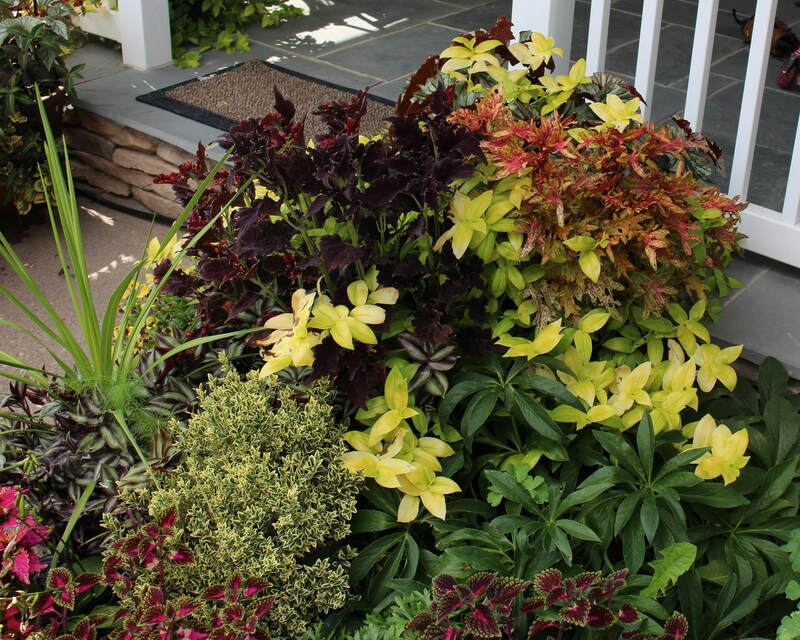 I wish I could explain my thinking out front, but it was really just a matter of using up stray coleus cuttings and overwintered tropicals. This pink coleus is my problem child. While all the rest are happy growing colorful foliage the pink one insists on forming flowers. I just keep pinching them out, hoping someday the plant gets the message. Every couple days the begonia needs to be dug out of a yellow landslide. I suspect there’s at least three pots buried under all this. The other side of the front entry is also a horticultural tsunami. Vacationing amaryllis (hippeastrum), a few geraniums, and some on again off again gerber daisies are trying to fend off the looming sunflowers and an uninvited pumpkin. Serves me right for letting the pumpkins rot on the front steps all last winter, but the new pumpkin forming is almost like a self renewing Halloween decoration! So after all of the mess at the entry our hanging porch planters are fairly plain. The asparagus fern gets thrown in the garage each winter, nearly dies by April, and then springs to life once regular watering resumes. It doesn’t drop faded flowers on the porch, doesn’t mind a week or two of forgotten waterings, and cost me about $1 a piece several years ago. I appreciate all these strengths yet she who judges doesn’t like these pots at all. Flowers would be nicer she says. 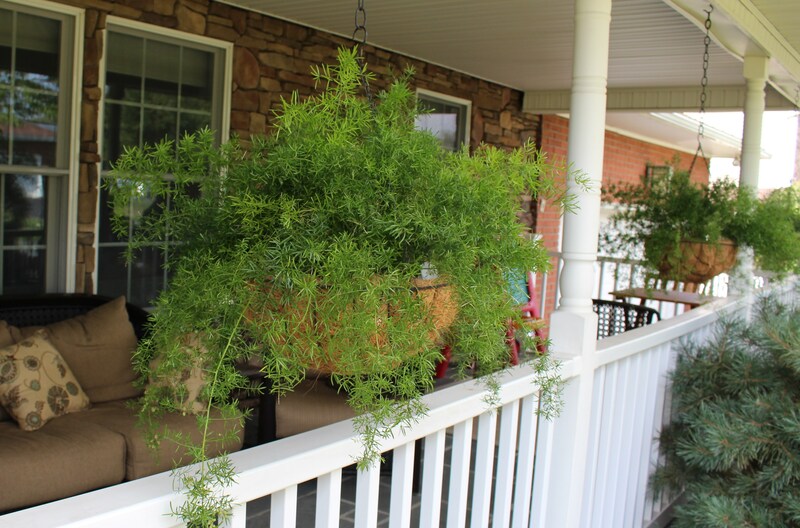 Asparagus fern, just the kind of hard to kill plant which survives under the shade of the porch, out of the reach of any saving drops of rain. Now if I replaced the ferns what would I put there? Maybe she means add more pots all around the porch, that’s probably what was implied, and that might be a good starting point for next year. Come to think of it she did say she wouldn’t mind even more potted plants out back, and contrary to what I thought, she said it’s not too much back there on the deck. This of course kind of encourages me to find out what too much is, and it’s these kinds of challenges which fuel your imagination in February. I did still want to add a small eucalyptus tree after all, just a small one. 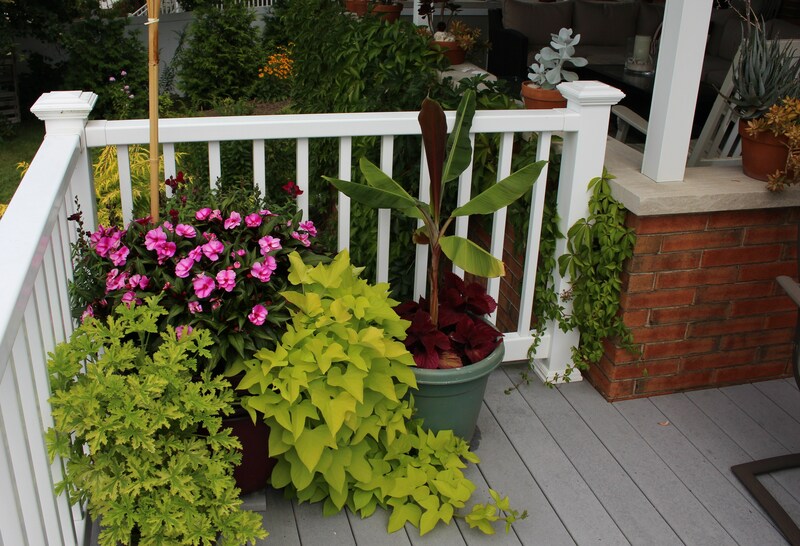 This entry was posted in annuals, deck plantings, late summer, Uncategorized and tagged Container plants, deck planters, good patio plants, planting in containers. I hope you and ‘the one that judges’ have plenty of opportunity to actually sit on your deck; with the flowers on it and the views I could see in the background it looks the perfect place to sit with a coffee or a nice glass of wine or beer if you prefer. I have to admit to a certain envy of your pots. I am just NOT good with pots at all. My only success has been with some succulents this year, but pots of bright colour just fail! Having seen how great yours look and my decision to have an evergreen view out from the front of the terrace perhaps I really should try much harder next year. We do get out there to enjoy the view as much as possible, and even when inside I’m always staring out the window, even on the worst days. It’s hard finding something which lasts the whole season, especially in your heat, and I don’t think you want to use as much water as I do. The succulents might not seem bright at first, but several have surprised me, sending up bright bloom stalks even after weeks of neglect! I suppose pelargoniums are the obvious choice, I have some plants in the greenhouse that were cuttings last year but they didn’t find their way into pots! I have just bought what the Italians call a blue geranium ( the name escapes me at the moment but you probably know what I mean! I don’t think you can go wrong with pelargoniums, even if you don’t seem excited about the choice. -but I have no idea what could pass as a blue geranium! Wow, your pot-plants leave my poor, poor efforts for dead. Some go into the basement, others are overwintered as cuttings, and the rest either die or spend the winter hanging onto life in the back of the garage. As long as it stays above freezing and I remember to water every month or so they usually recover when they go back outside. Well said. I get kind of potted at times myself. I love other people’s pots but don’t do too much myself. Can’t get over your variety and sheer numbers. My gardening spouse is not crazy about plants in pots. He likes big dramatic empty pots as art statements. My pots are not of the dramatic sort, so without plants it would look more ‘abandoned garden center’ than artistic statement, but I do like the look of a nice big empty accent pot…. I’m just no good at selecting one. I’m always caught somewhere halfway between bold and beautiful and I’m afraid I’ll just end up at boring. Pots are a labor of love. You certainly have created oases in every direction. 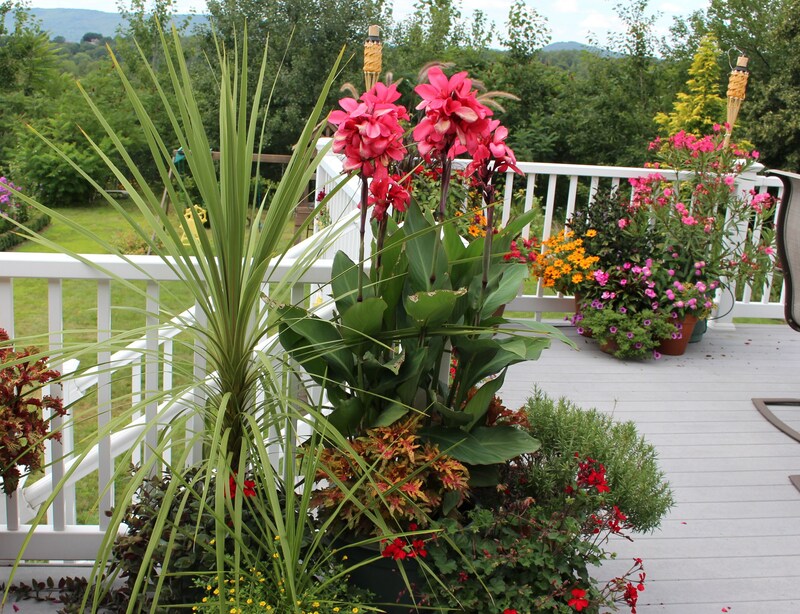 Thanks Susie, the pots are one of my favorite plantings at this time of year. My hat’s off to you for the energy and time spent on all those beautiful containers! I confess that after my orchid-growing days ended, I went entirely in the opposite direction and decided that I never wanted to repot or to water a pot for the rest of my natural life, LOL. haha, you did have quite the orchid business going there, I can’t even keep one alive! Oh I wish I could plant this many pots, but most of what I put in pots is then composted as I have no way to overwinter any of them, except for a few herbs….I actually have gone in the opposite direction and planted less pots. 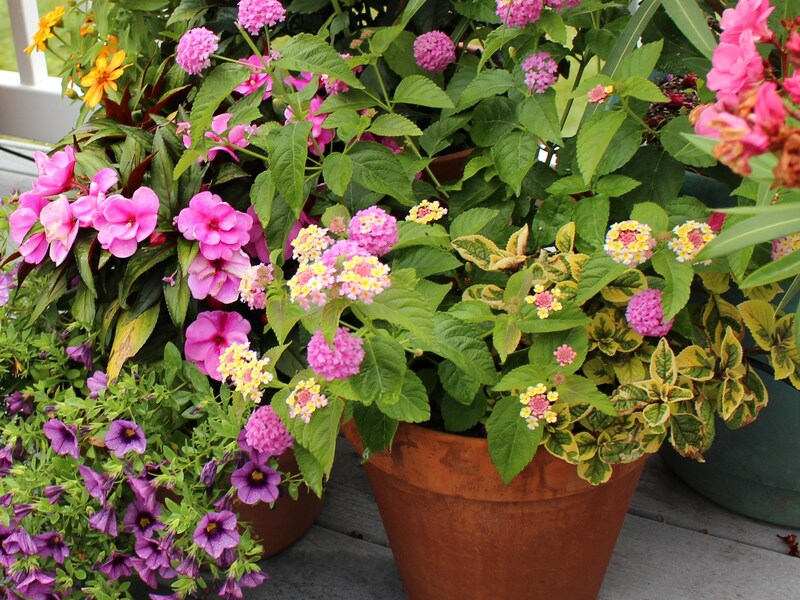 Pots can be a lot of work, and overwintering can be a tricky mess if you don’t have a good spot for them. I have a decent spot for most plants and slowly but surely I’m building my collection up again… but only the ones which don’t take much pampering! As one addict to an other, it seems just the right amount of pots! Yours are quite impressive (at least much better maintained than mine). Late planting goes a long way in keeping things fresher looking into September, thankfully I’m an experienced procrastinator, and the delay is easily planned into the spring schedule. That and a drip system on a timer. Things would have been dead in July without that! Pots are addictive!! I have about 85. An angel wing begonia would be fabulous in the pots with the asparagus fern. Oh, I bet I have nowhere close to 85 pots! I almost feel bad for you and your addiction, but secretly I’m a little glad I never went off the deep end like that. Little pots don’t count, right? I only consider pots over 12 inches to count, the rest are just temporary. By that count I barely have 30 which is very reasonable I think. 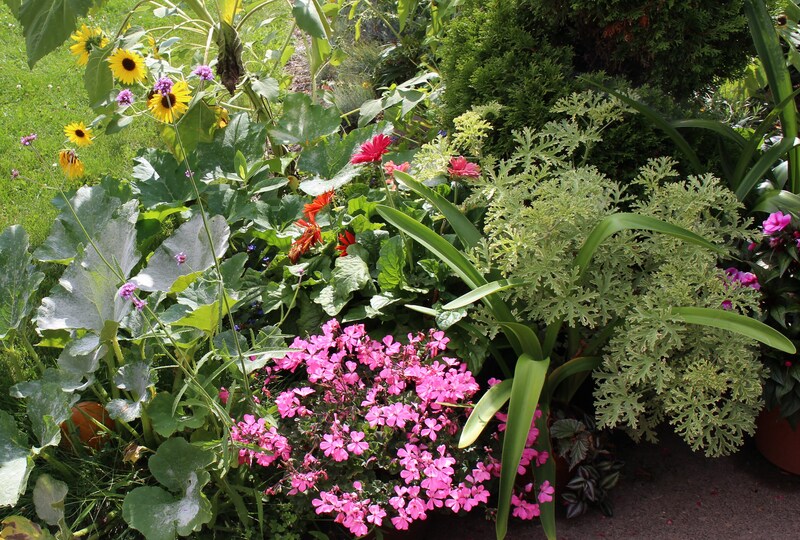 The bit of green that the fern adds among all the colors in the garden and other pots is nice. Yes, I try to add more green foliage, but the flowers distract me! I cheat of course. My fertilizing is haphazard with inorganic liquid feed and the watering is set to a timer. If time release fertilizer wasn’t so expensive I would put it in as well and be able to ignore caring for the pots for months at a time! What a fantastic collection of containers! Mine seem very bland by comparison. 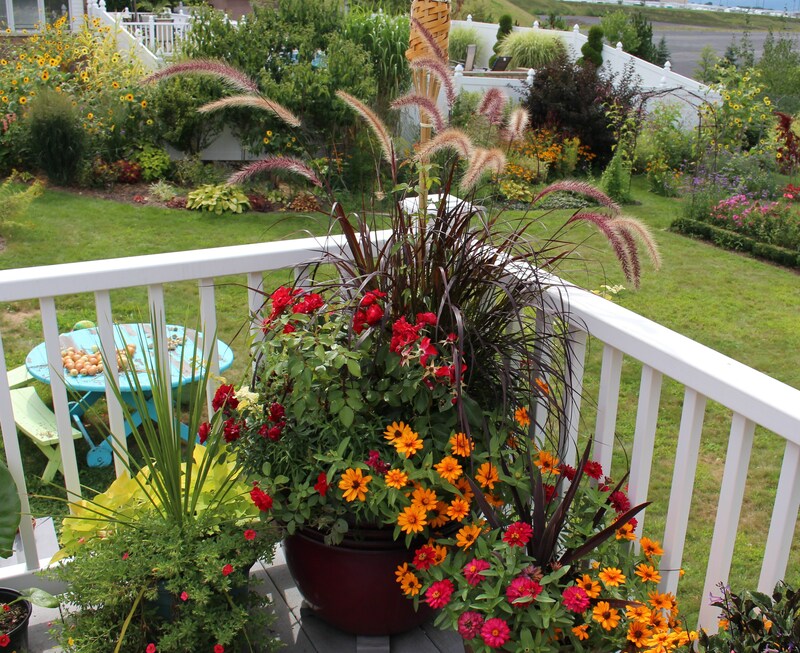 I especially love the fountain grass with the Zinnias. You’re selling your own pots short, they have quite a zing to them as well! The purple fountain grass is always a favorite of mine, if I didn’t have to buy it new each year I’m sure I would plant way too much.